Complications during or after surgery are happening too often at New York City, St Luke’s Hospital. The Hospital scored a low overall surgery rating on the new Consumer Reports surgery safety rating. The safest hospitals in the city to have surgery are Mount Sinai, NYU Langone Medical Center and New York Presbyterian Hospital. Consumer Reports looked at medicare claims data from 2009 through 2011 for patients undergoing 27 categories of common scheduled surgeries. For each hospital, the results for all procedures are combined into an overall surgery rating.The global ranking is based on who died in the hospital or stayed longer than expected for their procedure. 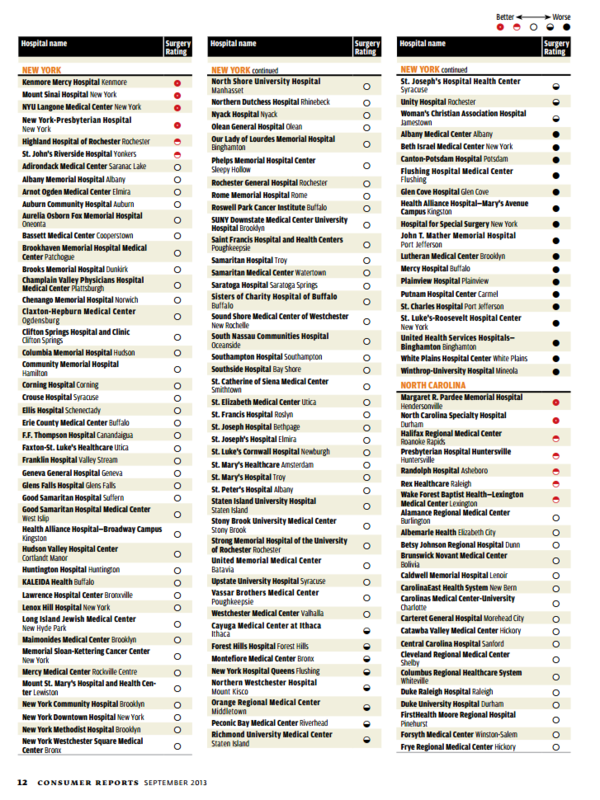 More detail by type of surgery as well as a hospital ranking by state can be found on the Consumer Reports website. Most common surgery complications are bad reaction to anesthesia, heart problems or surgeon nicking a blood vessel, leaving an instrument inside, or even operating on the wrong body part. Complications can also happen after the surgery. Nationally, 30 percent of patients suffer infections, heart attacks, strokes, or other complications after surgery and sometimes even die as a result.